Here’s an ideal Christmas illustration for nature and animal enthusiasts! 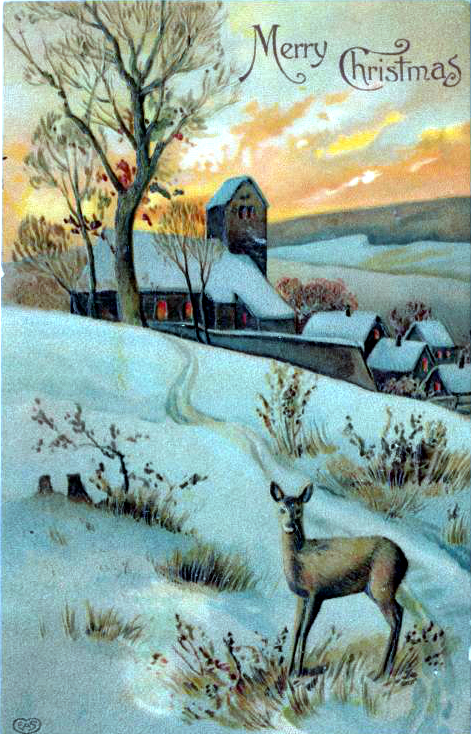 This vintage holiday card comes to us from 1910 from the Publishers at E. A. Schwerdtfeger & Co.
Now in the public domain, this vintage holiday illustration features a classic snowy, wintry scene complete with snow-topped villages and a deer. Perfect for Christmas crafts or to send to your family and friends. You can also find this antique Christmas postcard and the public domain collection at the New York Public Library. For more free Christmas images, check out the complete Christmas illustration Library. And like and follow on Facebook for exclusive vintage images you can’t find on the site.